There are so few people in this world who lived as fully — and as lovingly — as Phyllis Diller. I was always deeply inspired by her, and when Phyllis died on August 20, 2012, it was like a bright light went out in this world. Diller was an entertainment icon, with a stand-up, television and motion picture career that spanned six decades. A pioneer in women’s comedy, she was known for her over-the-top wit, outlandish outfits and her parodies of domestic life. She was completely different, utterly outrageous, and truly unforgettable. The younger generations may not be as familiar with her, but there was a time when everybody knew and loved Phyllis Diller. She had a universal quality about her that helped her stay relevant so long — it was something she always strived for. There were times in my life when I needed a bit of laughter to get through difficult situations. 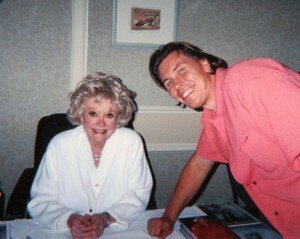 And Phyllis Diller was one of the biggest sources of laughter and warmth. I used to listen to Phyllis Diller Laughs, one of her first comedy records, over and over again. Laughter helped me go on, no matter what was happening around me. And that’s when I started developing my own comedic sensibilities, trying to be just like the wonderful performers I knew on television. As a child I would even work out little comedy bits as I walked to school, which I could sprinkle throughout the day. It definitely made life more manageable, and gave me footing and an identity. I looked forward to any appearance by Phyllis Diller on television, even in the briefest cameo. They were always great, because Phyllis was always on. Incredibly sharp and quick as a flash, Diller was a lot more than just her stand-up routine: she had a fantastic and diverse mind, a wellspring of creative abilities, as well as well as those famous comedy chops. You truly never knew what to expect from Phyllis Diller. One moment she would be telling a joke, the next playing classical piano, or maybe discussing life philosophy with a real understanding of the world. Diller constantly credited one book as being the key that unlocked her potential: Claude M. Bristol’s The Magic of Believing. She said as soon as she started to read it, everything started to make sense, and she knew exactly where she had to go with her life. It was what gave her the courage to do something that women simply did not do in the 1950s (stand-up comedy), and allowed her to focus — undeterred — on her creative and spiritual goals. As Bristol says, “…Thoughts become things,” and you will become precisely what you allow yourself to be, as long as you truly believe it. That amazing little book is what allowed the Phyllis Diller we all came to know to come into being. Diller genuinely cared for her fans. If somebody wrote her a letter, Phyllis would respond personally… and in short order. She knew that the fans, and the love that she received from them, were why she was able to have her wonderful career and live the life she wanted to live, so she always took the time to acknowledge them. You will find accounts from people all over saying how Phyllis wrote to them personally, and how it really touched them. It is a simple thing that really means a lot. In the late 1980s, Diller had her own line of canned chili called Phyllis Diller’s Original Recipe Chili, later dubbed Philli Dilli Chili. Man, was that ever good! I would stock up on cans of it (both chicken and beef), and eat it all the time. It did not last long on the market, sadly. Knowing how much I enjoyed it, Phyllis was kind enough to send me her personal recipe, along with a few others. Phyllis had a real gift in the kitchen, let me tell you! Diller was also a fine painter. I would not count her as a master, but her paintings were a great deal of fun, and a definite representation of who she was. She was certainly prolific, and had gallery shows all over the country. At a time when I could ill afford making a major purchase, I decided to buy a painting of hers that really spoke to me. I’m so glad I did! The painting hangs above my bed like a smiling, radiant sunbeam, and brightens my every day. And I can definitely say that Phyllis’ loose, no-nonsense, whimsical approach to painting has been a direct influence on my own watercolor style. It’s hard to put somebody like her into one word. But, if I had to, it would probably be “love.” She loved life, loved to give, loved the people in this world, and it was constant. And she loved herself enough to allow her life to be precisely what she wanted, so she had an open channel for that love to filter through. There’s a lot of lessons to be learned from that. When I think of Phyllis Diller, I think of a person who lived life to the fullest, without compromise. I would like to be just like her. Don’t we all? Another fine and fitting tribute, Kurt. I am so pleased that you got to know this amazing woman as you did; this is more than most fans can say about anyone whom they may admire. Phyllis was a class act, both on and offstage. Her treatment of her fans should be the gold standard. You are lucky. And I think I will make chili soon. It’s a dilly! We loved Phyllis Diller chili. Would you be willing to share the recipe? Hi Plowboy! Just wondering if you’ll post a blog entry remembering Percy. For years I have been trying to find Phyllis’s recipe for chili. As I am getting ready to make chili today I decided to look one more time to see if the recipe might be online and I found your article. My experience was the same as yours in that it was the best chili ever. I used to stock up every trip to the store and finally it was no longer available and the store could not special order it for me. I had used my last can and could not find out who was packaging and selling it. Is there a cookbook that would have the recipe or would you be willing to share her recipe with me. I just added the recipe today. Hope you enjoy! I have added the recipe for you. Hope it’s as good as you remember! Norman: posted today on his web site.